How worried should drug companies be about supplements eating into their monopoly profits? A lot—as this story will show. Please share it with anyone you know who is suffering from Alzheimer’s or is worried about it. Of course, just about everyone worries about Alzheimer’s. It currently afflicts 5.2 million people in the US and is the seventh leading cause of death. The cost of treating it is estimated at $148 billion. - A very interesting report by Dr. Mary Newport, her husband was in the throes of Alzheimer's disease at the young age of 58. She did lots of research into Alzheimer's, and came across two scientific articles regarding the therapeutic implications of medium chain triglycerides (MCT Oil) also known as Ketone Bodies or ketoacids. Our bodies use Ketoacids as a form of fuel when there is no glucose available. Neurons in brain cells are very particular about what fuel they use, normally they use glucose but they can use Ketoacids. Normally Ketoacids are not circulating in the body except if the body has gone without food for days or if a person is consuming a low carbohydrate diet e.g. Atkins Diet. In Alzheimer's certain areas of the brain, the neurons are unable to take up glucose due to insulin resistence and so the neurons slowly die. In the body MCT oil is digested differently, it does not get stored as fat, in the liver it produces ketoacids which can be used as fuel by the body. Coconut oil is 96% Medium Chain Fatty Acids, it contains Omega 6 Fatty Acid, and other short and long chain fatty acids and it contains no cholesterol. 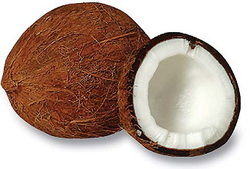 Mary started giving her husband 7 teaspoons of coconut oil a day and the improvement in his condition was amazing. Read the full report press the red title above.